It is important to ask: where is the powerful disciplinary knowledge? Alaric Maude has asked this question for the school geography curriculum in Australia. He has proposed a typology of geography’s powerful knowledge. You can download this framework and use it to evaluate a curriculum, a geography textbook or your own teaching. You might conclude that it is very difficult to find some aspects of powerful knowledge simply on the printed page of a curriculum document, or even in a textbook. We need a technique to help us find the powerful disciplinary knowledge in our teaching. It is possible to write short ‘vignettes’ that illustrate the powerful disciplinary knowledge (PDK) in our geography lessons. A vignette should concisely describe the content of a geography lesson and then discuss how this content contributes to the development of PDK. You can write a PDK vignette by following the instructions on the template at the bottom of this page. Here is an example PDK vignette on the topic of climate change and greenhouse gas emissions.This vignette explains PDK in terms of developing a global perspective and deepening understanding of global interconnectedness. This vignette is paired with a recording of a BBC radio broadcast featuring the late Doreen Massey. You can find many more examples of PDK vignettes on the GeoCapabilities Story Map. 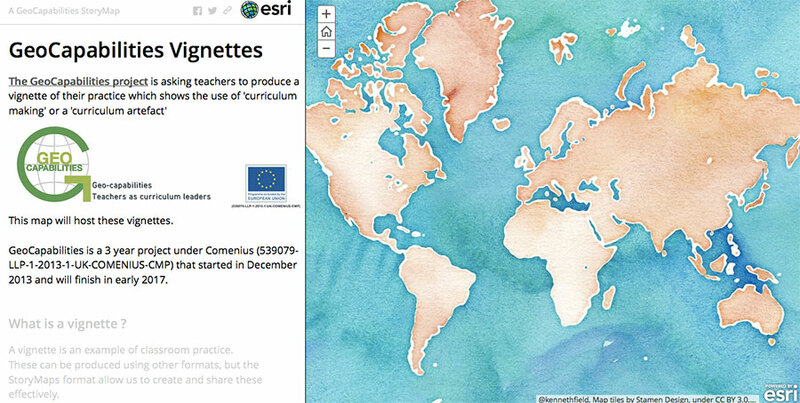 Over time we hope the Story Map grows to include a diverse array of vignettes to help geography teachers understand how geographical knowledge helps young people understand and interpret the world in ways that are distinct from other ways of knowing and thinking.